This week Arcola Theatre is presenting its proposals to the public for developing a site in Ashwin Street, Dalston, as its future home. The vision includes "an expanded Arcola Theatre venue including an enlarged main house to draw exceptional national and international productions. Around this core will sit the Arcola Energy sustainable technology incubator, enterprise and skills studios and ethical café/bar/restaurant facilities." The Theatre has outgrown its current premises in Arcola Street, Dalston. Whilst plans for what the new Arcola will contain are well developed, the precise site and architectural scheme are far from decided. Thus the launch of the proposals is accompanied by a public exhibition of 18 very different architectural possibilities which Arcola hope will further ongoing discussions about the future of Dalston Junction. More details about the Future Arcola consultation exhibiton can be seen here. You can visit the exhibition between 10.30am - 5.30pm every day until Friday 7th August at Studio 5 in Arcola Street Dalston. Let them know you are coming by telephoning 0207 503 1646. Part of the Future Arcola Theatre exhibition. 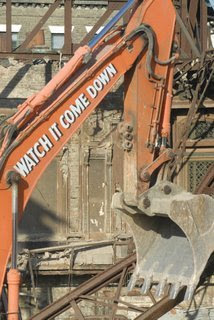 OPEN members will recall how in 2005 Arcola's Executive Director and energy scientist Dr Ben Todd and Executive Producer and writer Leyal Nazli worked and campaigned with OPEN to try and save the old Dalston Theatre and locally listed Georgian houses for re-use. Arcola Theatre's founder and Artistic Director, Mehmet Ergen, wrote an impassioned letter to Hackney's Planning Comittee members urging them to consider multiple uses for the site, including a new and much needed expanded venue for Arcola Theatre. 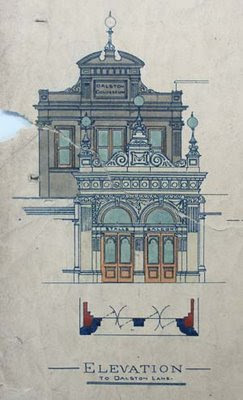 The original plans for the new 1898 entrance to the Dalston Theatre of Varities, built forward from the original 1886 Dalston circus entrance, at 12 Dalston Lane. Sadly Hackney demolished the buildings and that site is now part of Barrat's 'Dalston Square' tower-block scheme at Dalston Junction. Nevertheless Arcola Theatre's ambition and determination has continued and many of its visions are already being realised - not least progress towards becoming the first carbon neutral theatre in the UK. These pictures illustrate some of its diverse activities. Training in theatre technology takes place for young people at Arcola theatre. 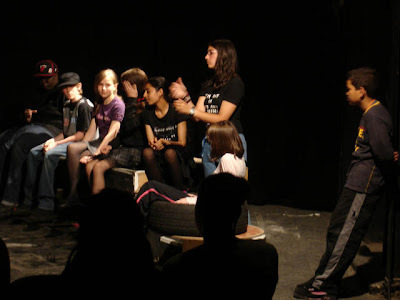 Arcola Youth Theatre gives training and performance opportunities for the next generation of actors. One of Arcola Theatre's many performances in their bar. 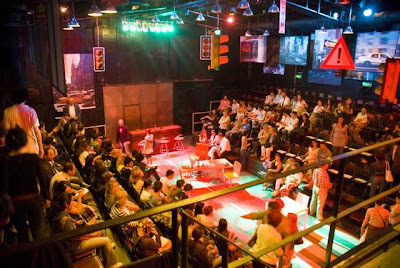 Arcola Theatre has gone international - here is its theatre in Istanbul. Don't miss the exhibition Future Arcola. It's a chance to see and comment on what the future could hold for Arcola Theatre and for a key site at Ashwin Street, Dalston. The development could anchor the emerging creative hub there and greatly enhance the public space. Ashwin Street, Dalston with the Reeves Printhouse at the northern end - already a hub for small creative businesses.